How many clubs are allowed in a golf bag? Find out below. If you’re just beginning to pick up golf, there’s a ton of information to learn about the game. For beginners, it can be incredibly intimidating and sometimes prevents people from playing at all. The rules regarding how many clubs in a golf bag, as with a load of other important tidbits, can get overlooked as teachers focus on the most important parts of the game. But every golfer needs to know how many golf clubs they are allowed to carry. Below, we answer that question and provide a ton of other important information that will help any golfer getting started in the game, in addition to any experienced golfers too afraid to ask the simple questions. Let’s get right to the point. Golf’s governing bodies, the USGA and the R&A, have strict regulations on just about everything you can think of when it comes to golf equipment. How many golf clubs you’re allowed to have in your bag is no different. The official maximum number of clubs allowed in a golf bag is 14. So, in a nutshell, golfers are restricted to carrying a maximum of 14 golf clubs in their bag during a round. What’s the penalty for carrying too many clubs? The penalty for carrying too many clubs in your bag is two strokes for each hole where a breach of the rule happened. That means if you have 15 clubs in your bag but don’t realize until you’re playing the second hole, you will receive a four-stroke penalty. Fortunately, the maximum penalty for breaking this rules is four strokes, so it won’t get any worse than that. If you realize the breach while playing a hole, the penalty is assessed at the end of the hole. If instead you notice the violation in between holes, the penalty is applied to the hole you just completed. In Match Play, the penalty is one hole, meaning that if you break the rule the total match score is changed, instead of you just losing the hole you’re playing. What’s the procedure for taking clubs out of play? The procedure for removing an extra club from play is straightforward. Once you realize the violation, you must “immediately take an action that clearly indicates each club that you are taking out of play.” You can do this by alerting another player to the violation or by turning the offending club upside down in your golf bag. Can you use your playing partner’s golf clubs? This is a simple one; the answer is no. Under the Rules of Golf, you are not allowed to use another player’s club during your round to make a stroke that counts to your score. So, if you want to share your friend’s clubs or test one out, you’ll have to do that on the range before or after you play the course. Interestingly, the rules do allow you and your playing partner to carry your clubs in the same golf bag. But you still cannot use each other’s clubs, and you must clearly identify which clubs belong to each player. Similarly, you can’t get around the rules by carrying 14 clubs in your bag and having your caddie or any other person carry your extra clubs. Other people are not prohibited from carrying clubs for you, but they must be included in the total of 14. Is there minimum number of clubs you can carry? There is no minimum number of clubs you can carry, only a maximum. So if you’re dying to play a round with only a putter, have at it. Can I add clubs to my bag during a round? Interestingly, you are permitted to add clubs to your bag during a round, provided that you keep it to 14 or fewer clubs, and you can thank the new rules for that. For example, if you were to start a round with 13 clubs, you could add another club without penalty at any point, as long as you don’t break any other rules in the process. 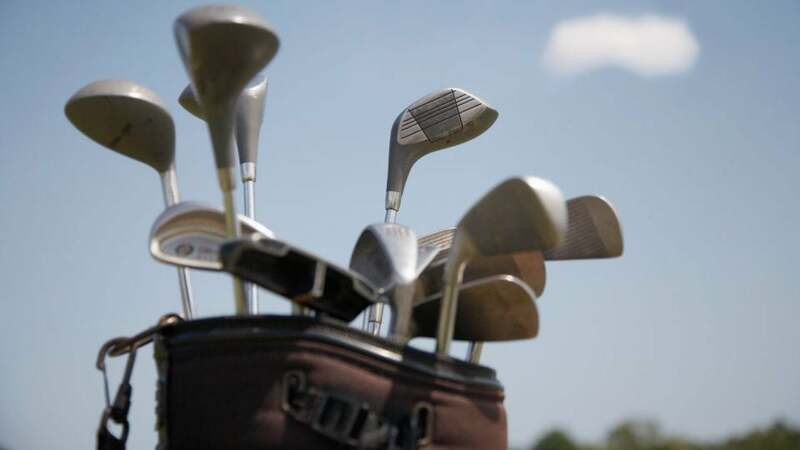 Does the type of golf clubs in your bag matter? All clubs you use or carry in the course of a round must conform to all the regulations on clubs stipulated elsewhere in the Rules of Golf. That being said, there are no rules governing the make-up of your conforming clubs. So if you want to carry four putters, five drivers, and five lob wedges, you are free to do so. The most notable violation of the penalty occurred at the 2001 Open Championship at Royal Lytham & St. Annes. Ian Woosnam made birdie at the opening hole that year to tie for the lead with just 17 holes to play. When he arrived at the 2nd tee, Woosnam realized he had an extra wood in his bag, bringing the total he was carrying to 15. After famously tossing the offending club across the tee, Woosnam was assessed the appropriate two-stroke penalty and fell into a tie for 6th.